What are the advantages of the Flynn Multi-Frame System? First of all, with the three rail system of the Flynn Multi-Frame, you don’t have to baste. The layers are held seperately from each other, and they are really tight. You won’t have any puckers in the back with a Multi-Frame System. Actually, the Multi-Frame’s tension system is patented – our imitators can’t duplicate that. Next, you sit up nice and straight in your chair, where you can see your work and just slide the Multi-Frame on the deck of your sewing machine. No cramps in your hands or shoulders and no wrestling the bulk of a big quilt through the sewing machine. Take a look at the simplicity of the Flynn Multi-Frame. It is straight forward, extremely easy to assemble, effective and economical. 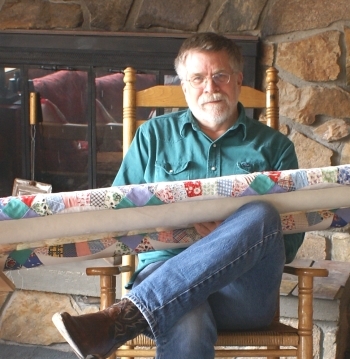 Designed by well-known quilt instructor and author JOHN FLYNN, you can be sure that, with a little practice, the Multi-Frame will help you say goodbye to pinning, puckers in the back, sore hand and shoulders and all those other frustrations that have been a part of machine quilting for too long. How Big a Quilt can you quilt on the Multi-Frame? It is easy to make the Multi-Frame any size you need. What you do is measure the width of the project you want to work on. Then purchase your own Metal Conduit (EMT) 6” longer than the width of your quilt. Get either ¾” or 1” in diameter. Most quilters end up with 3 or 4 sets of rods for different widths of projects. You can put a narrower project on long rods by making the side tension ribbons longer. Why don’t you make the frame ends longer to allow more quilting space? The Flynn Multi-Frame is designed to be used for machine quilting with your home sewing machine. Most home sewing machines have from 6 – 9 inches of space between the needle and the back post of the machine, so any additional frame width would just be in the way of what is happening at the needle, and that is what is important. 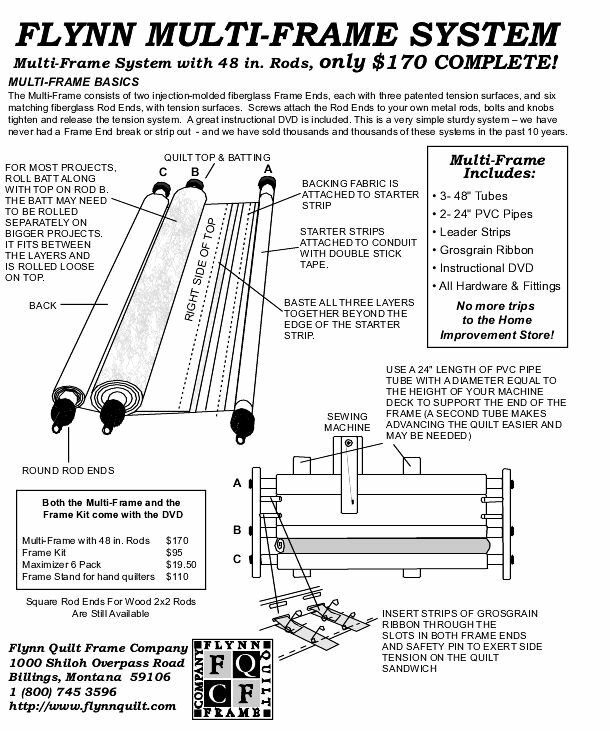 The Multi-Frame is also ideal for hand quilting. The 10 inch quilting space is adequate for most projects and, if more space is required, you have the option of machine basting your hand quilting project on the Multi-Frame with water soluble thread and then removing the middle rod to give you 15” of hand quilting space. When quilters are just starting to use the Multi-Frame, they sometimes tell us they are frustrated by the amount of room they have to quilt in. When they stop to think about it, they realize that the amount of room under the arm of their sewing machine is what determines how much room they can work in, and this is true no matter how they choose to machine quilt. After some practice and experience in planning and choosing a quilting pattern, quilters get used to the available area. Look for at least 6” - 6.5” as a minimum from the machine’s needle, measuring to the right where the arm rejoins the body of the machine. The more room, the better, of course! With Pfaff machines, get a Big Foot from Little Foot so you can put your lever all the way down. This keeps the lever from bumping in to the roll of accumulating quilt on Rod A and gives you more room to quilt in. What is with the metal rods? The metal rods are used because, for their strength, they are the least expensive option and they are easily obtained in most areas. The Multi-Frame and the Multi-Frame Kit each come with round rod ends for metal conduit (EMT). The round rod ends have micro teeth and can be used with ¾” or 1” metal pipe. Use 1” pipe for bigger projects, as it is more rigid. Two lengths of machine set screws are furnished so the rod ends are easy to move. *NOTE – small diameter PVC pipe is not an acceptable substitute for metal conduit. Here are two more tips; one for securing the big bolt into the Rod End (it is supposed to fit very, very tight) and a tip to use when you are ready to switch from the 48" fiberglass rods to metal pipe for longer rods. Each time you finish quilting a “reach”, loosen all six knobs, and roll most of the quilted portion up on Rod A. The unquilted top and back automatically unroll off Rods B and C. Leave an inch or so of quilted work exposed in your work area, especially with an all over pattern, so that you can get back up in to the quilting pattern of the earlier reach and make everything look continuous. It’s easy to change the bobbin, whether you have a drop in bobbin or an “underneath” bobbin. For a frontloading bobbin, just reach under and change it. If your bobbin loads right under the needle, cut the top thread and scoot the Multi-Frame down so that the opening between the quilt sandwich and the Frame Ends is right over the throat plate and bobbin area. Wind lots of bobbins before you start quilting!